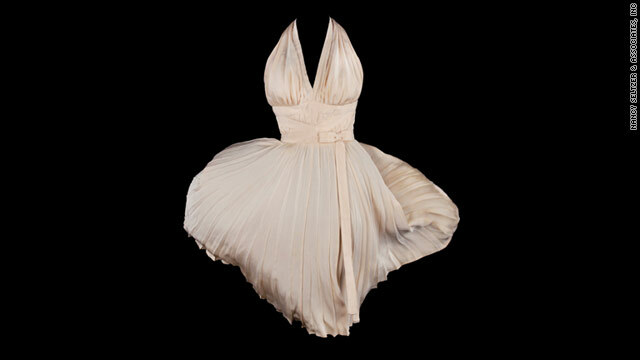 Marilyn Monroe wore the famed "Subway" dress in "The Seven-Year Itch." Los Angeles (CNN) -- Marilyn Monroe's white "subway" dress sold for more than $5.6 million in a Beverly Hills, California auction Saturday night in which bidders paid another $2.7 million for three other Monroe movie outfits. It was the first in a series of auctions to sell the massive Hollywood history collection that singer, dancer and actress Debbie Reynolds accumulated over the past 50 years. Reynolds was in tears when, after 20 minutes of drama, the gavel sounded an end to bidding with the price at $4.6 million. With the auction company getting a $1 million commission, the buyer will pay $5.6 million. It had been expected to sell for $2 million, the auction house, Profiles in History, said. The red-sequined showgirl gown and a feathered hat Monroe wore in "Gentlemen Prefer Blondes" sold for $1.47 million. The expected price was $300,000. 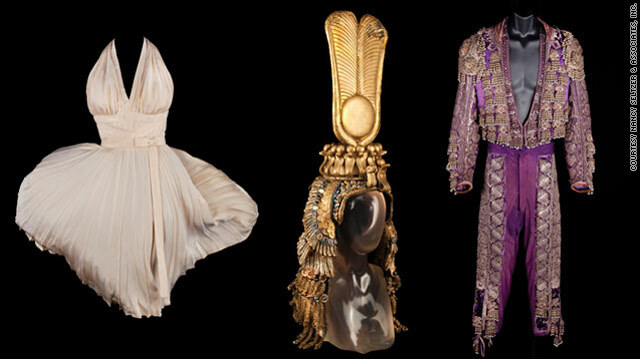 Monroe's costumes from "There's No Business Like Show Business" and "River of No Return" brought another $1.2 million Saturday. The previous record price for a Monroe dress was $1.26 million paid in 1999 for the sheer white dress the actress wore in May 1962 when she sang "Happy Birthday" to President John F. Kennedy. Morgan, who is writing a book about Monroe's death, said the actress would have been shocked to know her dresses would sell for so much. She only had $2,000 in her bank account at the time of her death, he said. Reynolds accumulated 3,500 movie costumes and thousands of props over the past 50 years with the hope of housing them in a museum. Taking care of the treasures became a financial burden on the 79-year-old entertainer, leading to her decision to sell, she said. Other high-priced items included a blue cotton dress and a pair of ruby slippers made for Judy Garland in "The Wizard of Oz." Although both items were only test costumes never worn in camera, they brought a combined price of nearly $1.75 million. A matador outfit worn by Rudolph Valentino for the 1922 film "Blood and Sand" sold for $258,000. The auction house predicted before the sale it would go for about $80,000. One of Charlie Chaplin's signature bowler hats, worn in several films, sold for $135,300. The World War I military uniform worn by Gary Cooper in the 1941 movie "Sergeant York" was purchased for $67,650. A bidder paid $73,800 for the velvet brown racing silks and riding pants worn by a young Elizabeth Taylor in "National Velvet."